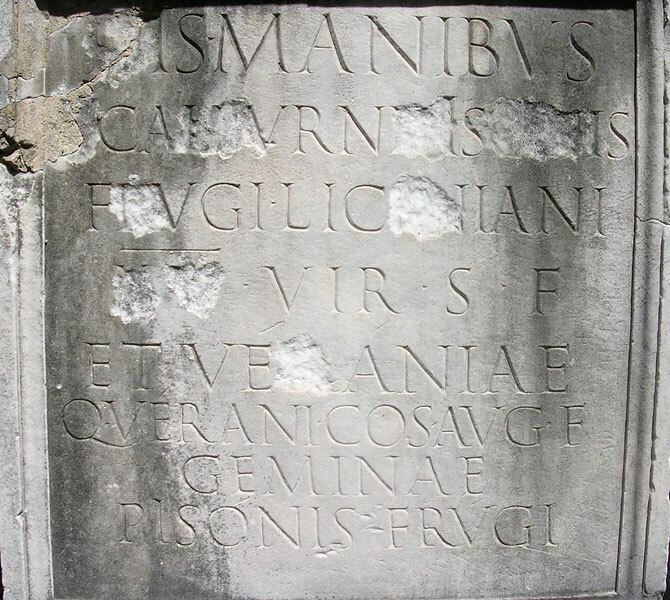 Funerary inscription of L. Calpurnius Piso Frugi Licinianus and Verania Gemina. Dis Manibus / [L(uci)] Calpurni Pisonis / Frugi Liciniani / XVvir(i) s(acris) f(aciundis) / et Veraniae / Q(uinti) Verani co(n)s(ulis) aug(uris) f(iliae) / Geminae / Pisonis Frugi. To the gods manes of Lucius Calpurnius Piso Frugi Licinianus, XVvir sacris faciundis, and of Verania Gemina, the daughter of Quintus Veranius, consul and augur, the wife of Piso Frugi. Lanciani R. Supplementi al volume VI del Corpus Inscriptionum Latinarum // BCAR. Vol. 13. 1885. P. 101—103, n. 1024—1029.